The antiserum was produced against synthesized phosphopeptide derived from human NF-κB around the phosphorylation site of serine 468 (L-A-SP-V-D). 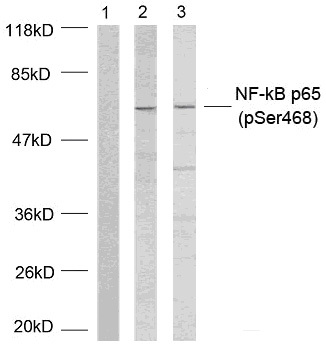 NF-κB p65 (phospho-Ser468) antibody detects endogenous levels of NF-κB p65 only when phosphorylated at serine 468. Buss H, et al. (2004) J Biol Chem. Schmitz ML, et al. (2004) Blood. Western blot analysis of extracts using NF-κB p65 (phospho-Ser468) antibody (E011013). using NF-κB p65 (phospho-Ser468) antibody (E011013, Red).